U.S. is afraid of deadly Tornado, Thunderstorms and tornadoes ripped through Oklahoma and Arkansas on 25th March, a damaging tornado touched down outside Tulsa, Oklahoma, last night. A person of U.S. has been totally frightened due to bad weather. One person was killed and several were injured when the tornado destroyed a mobile home park. 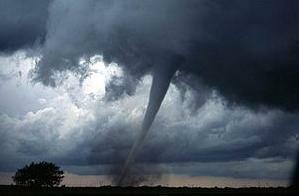 This type of killer tornado has been come in every seasons but this time it’s size so dangerous. This is not first time for U.S. but also a small twister was also reported in Moore, the Oklahoma City suburb that has been repeatedly ravaged by deadly twisters this decade. The first three weeks of March were tornado-free throughout the United States. According to the NWSSPC (National Weather Service's Storm Prediction Center) in Norman, Oklahoma, a typical March sees about 120 twisters, the center reports. Only March 1969 compares, without a single tornado until the 24th.